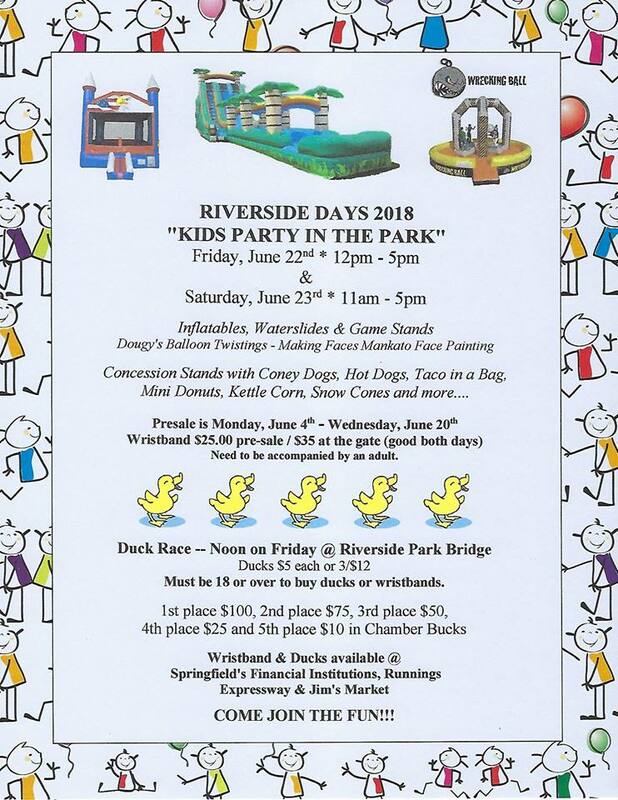 Pre-sale for wristbands for Kids Party in the Park and ducks for the Duck Race now through June 20th! Purchase your ducks for the Duck Race! $5 each or 3 for $12! The pre-sale for wristbands for Kids Party in the Park has started! $25 – good for both days. Wristbands will be $35 at the gate. The pre-sale for ducks and wristbands runs through Wednesday, June 20th and can be purchased at Springfield’s Financial Institutions (Farmers & Merchants Bank-Springfield and Morgan, Red Rock Bank and SouthPoint Financial Credit Union), Runnings, Expressway and Jim’s Market-Springfield. Must be 18 years or older to purchase ducks or wristbands.